The award-winning attorneys of Kraft Davies, PLLC PLLC have a long history of helping injured longshoremen and other workers injured on vessels, docks, and piers in collecting damages from third-parties for injuries at work. Longshoremen work on docks unloading cargo ships and vessels with cranes and heavy equipment. These skilled union workers earn good wages and an injury can devastate their families. Over the years, our lawyers have assisted many longshoremen and their families in the process of putting their lives back together after a serious injury. Although a longshoreman generally cannot recover damages beyond workers' compensation from his employer, the longshoreman may have a claim against another company, including the owner of the vessel on which he or she was injured. If a third party claim exists, it may provide substantial additional benefits to the injured longshoreman. 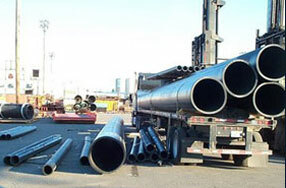 A longshoreman may have been injured by a defective product or equipment. Under these circumstances, we may pursue a product liability claim for the longshoreman. Representing injury victims of accidents that occurred on docks and piers, our law firm has succeeded in helping many injured longshoremen and other dock workers obtain substantial compensation. Our clients often contact us after they have suffered serious or catastrophic injuries, including knee, wrist, neck and back injuries; amputations; spinal cord injury; head injury; and burn injuries. Our years of experience have given us knowledge, versatility and a reputation for tenacity in settlement negotiations and in the courtroom. Results vary from case-to-case based on the particular facts, but we have been proud to help many clients collect large settlements and verdicts, enabling them to get medical treatment and compensation for lost wages as well as pain and suffering. Section 905(b) of the Longshore Harbor Workers Compensation Act (LHWCA) "permits a longshoreman to 'seek damages in a third-party negligence action against the owner of the vessel on which he was injured." Bunn v. Oldendorff Carriers GmbH & Co., 723 F.3d 454, 460 (4th Cir. 2013) (quoting Howlett v. Birkdale Shipping Co., S.A., 512 U.S. 92, 96, 114 S. Ct. 2057, 129 L. Ed. 2d 78 (1994)). "While Congress created a cause of action against the shipowner in negligence in § 905(b), it left to the courts the task of defining the duties the shipowner owed to the longshoreman." Lincoln v. Reksten Mgmt., 354 F.3d 262, 266 (4th Cir. 2003). Taking on that task, the United States Supreme Court in Scindia recognized "three general duties shipowners owe to longshoremen:" 1) the "turnover duty," which "relates to the condition of the ship upon the commencement of stevedoring operations;" 2) the "active control" duty, which applies "once stevedoring operations have begun [and] provides that a shipowner must use reasonable care to prevent injuries to longshoremen in areas that remain under the active control of the vessel;" and 3) the "duty to intervene," which "concerns the vessel's obligations with regard to cargo operations in areas under the principal control of the independent stevedore." Howlett, 512 U.S. at 98 (internal quotation marks omitted) (citing Scindia, 451 U.S. at 167-78). These issues are some of the more complex in personal injury law and require the careful analysis of an experienced maritime injury lawyer. If you have questions about whether you may have a Section 905(b) claim, contact one of our experienced maritime injury lawyers for a free consultation. For more information or to schedule an appointment with an experienced attorney regarding a case that involves a dock or pier injury, injuries during longshore operations, injuries on ships to longshore workers, cargo injuries, maritime law, admiralty law or other workplace personal injury, please contact us or call 206.624.8844 for a free consultation. Headquartered in Seattle, boat dock injury attorneys of Kraft Davies, PLLC, represent longshore workers throughout the state of Washington.